Email is the backbone of today’s corporate business processes. It lives as the primary communication vehicle internally between employees and externally with customers, vendors, partners and investors. It is arguably today’s most pervasive and critical business application within which is stored the most valuable business content. 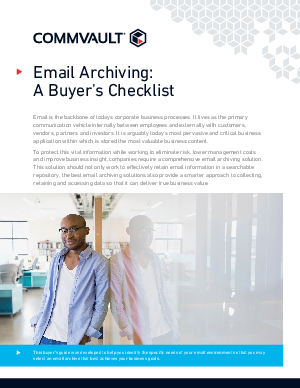 To protect this vital information while working to eliminate risk, lower management costs and improve business insight, companies require a comprehensive email archiving solution. This solution should not only work to effectively retain email information in a searchable repository, the best email archiving solutions also provide a smarter approach to collecting, retaining and accessing data so that it can deliver true business value.